is intelligent, full of energy, but above all it shows each of his affection. 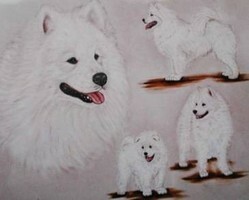 Beautiful, attractive, perhaps the most beautiful race in the world, gentle and sociable, a loving household, modern in the sense that you have no Samoyed dog smell in itself reliable in dealing with children, peaceful, yet in a position to be in a fight to contend with his own unusual innate intelligence. It is heart-winning great loyalty to the beloved master. These are the winning features of the big white dog, with the "smiling face" and dark intelligent eyes, a stocky, muscular body on runs that are made for high speeds. By the way, as the people of the Samoyed many centuries lived in tents that sprang up between the dogs and people a wonderful relationship. Without aggression toward humans and animals, they align themselves very closely to the people. After they have slept for centuries in the tribal tents, they were here and there can then refuse a night on the bed? This big white dog with the "smiling face" was held by all the dogs we know today first polar enthusiasts in Europe, more precisely in the UK. Its rapidly growing popularity, he owes not only its use by polar explorers such as Nansen during his expedition from 1893 to 1896, and the fact that Queen Alexandra, consort of Edward VII, was interested, for this race. The root cause of its diffusion rate in the Samoyed own nature, he was portrayed as a loyal, obedient, gentle and cuddly, yet again, an independent member of the household. Moreover, the striking proud bearing and his powerful, yet elegant figure, his smiling interest in everything that happens around him. So it is not surprising that a Samoyed chiefly cultivated for many dog lovers now regarded as one of the most beautiful dogs. The Samoyed was recognized as the first sled dog race at the end of the last century and until today has remained a typical northern dog. Their names were given the racial Samojedenhunde after the nomadic tribe of Samoyeds, who inhabit the border area between the European and Asian Siberia. There it was the duty of the dogs pull sleds, carry loads, to guard and protect reindeer and his helpers in the hunt. At night they were taken to warm into the tents. The ancestors of these dogs are probably the earliest domesticated, including their ancestors believed to be Torfhund. Remains of these ancient breeds of the six groups were found among other things, pile dwellings of the recent excavations of Stone Age. Torfhunde, sometimes called Torfspitze were distributed to about 4000 BC, about Europe and northern Asia. 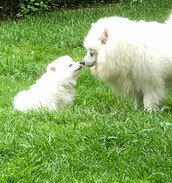 There is considerable evidence that the descendants of these dogs had a very long time with the nomadic tribe of Samoyeds at home. 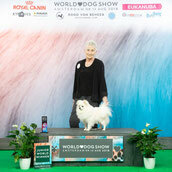 The dog then kept at almost the same job done as ever, although the Russian is now set for these features or Nenezker-Samoyed Laika Laika strongly deviate from the valid for our Samoyed, recognized by the FCI breed standard. According to this standard is in males a shoulder height of 57 (+ / -3) cm required. The head should be strong and wedge shaped, with well-trained not too long muzzle, dry lips and slightly raised mouth corners which provide for the breed type smile. The dark, almond-shaped eyes should be deep seated and well explained, the small, triangular, wide apart and high set ears are to have a slightly rounded tip. The strong neck of moderate length with well-arched neck is proudly worn. The building is slightly longer than tall, with a firm back and well-educated, deep chest and strong loin. Not too long, dense and bushy tail is set high and carried curled over the back. Lange, festanliegende, sloping shoulders and straight, bone front legs with strong joints are required, as well as a very well muscled, with deep scheduled sufficiently angled hind hock. The feet should be oval shaped, with arched toes and thick, durable pads. Indispensable is a double coat: the smooth, grannenartigen clothing hairs stand off slightly from the body, below that is a soft and dense undercoat. Males often have a so-called trained strongly mane. Only the head and ears as the front of the runs are short haired. However, in females the hairs usually shorter and softer in texture. 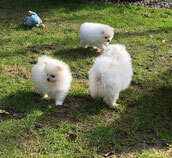 The coat color is usually white, is also allowed white with biscuit or cream-colored markings yellow. The pigmentation of nose, lips, eyes and pads surround preferably black. Thanks to its versatility, the Samoyed is both a sport as suitable as a family dog. The ability of the Samoyed sled dog race in is not so much in excessive speed, he is more of an endurance runner and can also draw heavy weight sled. In any case, he needs meaningful work and regular exercise, with an outlet only in the garden, it is not enough. Because of its tendency to act self-assessment in his youth, he needs a loving, yet consistent training. From his earliest youth accustomed to brush through thoroughly himself, prepares the grooming no difficulties. Since here the seasonal molt and loose-fitting all the hairs are removed immediately and the Samoyed clean considers himself well, he will leave little dirt. Of too frequent bathing is strictly discouraged.